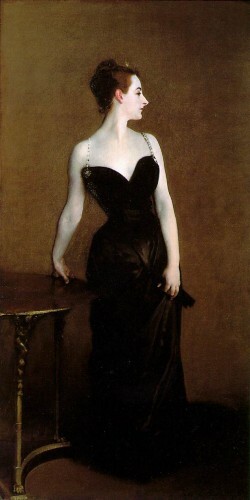 Madame X has always been a very inspiring, powerful image for me. I’ve seen this painting in real life several times, and it’s overwhelming and beautiful and just takes your breath away. She’s quiet, still, and imposing. I’m taking Power Stories over at Magpie Girl and our assignment this week was to think about a time we felt weak, or overcome and pressured into making a choice that was absolutely *not* the right decision. There are many of these, but there’s one sort of HUGE one that sticks out for me- when I let one of my professors in school talk me out of pursuing my dream of working in a museum. The guy was a truly miserable guy- he had run-ins with numerous other students and had made someone very close to me cry in shame and frustration on more than one occasion. I never liked him, and actually the second I laid eyes on him and heard what came out of his mouth the first day of class, my gut and intuition screamed at me that he was *not* a good person. I do realize now that I am GRATEFUL to him, in a small way, because if I had gone on to go to grad school in Art History and follow that path, I might never have met my husband or adopted my little girl, or have the life that I do, so it terrifies me to think of what could have been. There’s always a chance for me to go to back to school and find a career, so I’ll have the best of BOTH worlds. But it was a moment that destroyed me and altered my being. First, I didn’t listen to my gut. I knew this guy was a jerk- NOT a good person, yet I still sought his approval. My second error was that I listened to this guy, instead of listening to myself. I *knew* I had the passion and the motivation and the energy and the intelligence, but I let him plant a seed of doubt in my mind. I began to question myself, my health, and my future. My third mistake was instead of looking for things that would AFFIRM what *I* believed, I began to look for “an easy way out”. I immediately found 1,000 other reasons NOT to follow my heart. I guess I always had doubts about my physical ability to run a museum. I always had fears of new people and new places and if I were going to be able to navigate it. I disregarded the fact I volunteered and interned and spent all my free time in museums and NEVER had a problem with those things. But suddenly I let that seed of doubt grow and wrap its tendrils around everything. I started thinking I couldn’t possibly do it. I believed I wasn’t good enough, smart enough, or brave enough. So I ignored my gut, listened to someone who deep-down I did not respect or like, let him plant a seed of doubt, and then I sought an “escape route” from the hard work I had to do in order to achieve my goals. Why? At least I recognize the pattern of behavior, which has sort of repeated itself throughout my life since then. Ignore my gut, seek validation, let seeds of doubt grow, and then seek excuses for not listening to my intuition. The next part of our assignment is to reflect on a time when we WERE strong, we were powerful, and made a good choice. There’s actually been a few of those lately. It’s very very hard for me to say no, but I’m working on it. I think it will always be uncomfortable for me, but I’m learning how to put on a brave face and be a little less scared of what the consequences might be. First of all, as soon as I opened up this link and saw the beautiful Madame X, I literally sighed out loud. Mmmm. Such a sumptious, strong image. Thank you for reminding me of it today, and for connecting-the-dots for me between this stunning painting and Power Tances. Look at the position of confidence and strength Madame X is carrying! She really does seem to be holding space for us, doesn’t she? …. Her posture, especially the angle of her neck and head, is setting an example for me of how to stand in my own power, physically, with strength and grace. Chel, I CANNOT TELL you how awesome it is that you noticed this. Noticing this is a POWERFUL tool in your toolkit. You’ll be much quicker at quitening-down those Gremlins in the future, because now you’ve seen their sneaky trick. They were trying to protect you, but really, you didn’t need protecting — your inventory of things you already did successfully in the field of art (voluntering, etc) readily attests to that. Many people never see thier own (er, thier Gremiln’s) complicity in this kind of dynamic. Good. for. you. Finally, I like what you are saying here, about how your path away from your dream of running a museum lead to you meeting your husband and to adopting your daughter. You’re being really honest a bout how sometime a pain experience can have good results on the other side. I’m wondering how can you re-claim that story, so that it’s not his abusive nature that forced you onto a path that just happened to lead you to such happiness? I suspect that your own pro-active life-decisions had a lot more to do with finding your husband and daughter than he did. Just chew on that a little bit. I bet you start to see all the ways that your own powerful life choice lead to the famillial happiness you now posesses. Thank you so much for sharing your Power Stories with us Chel. Chel, I so enjoyed your eloquent story, your ability to look back and see, really see, what happened. To see it from the perspective of you now, and you then. Thank you for sharing this story!